After exploding onto the death metal scene in 2015 with their Leprosy-inspired full-length debut, Savage Land, death metal wrecking crew GRUESOME -- featuring current and former members of EXHUMED, POSSESSED, MALEVOLENT CREATION, and DERKETA -- returns in 2016 with a new EP entitled Dimensions Of Horror. Produced by the band and co-produced and recorded by Jarrett Pritchard at New Constellation RMP Studios in Orlando, Florida, Dimensions Of Horror is a gruesome salute to DEATH's iconic Scream Bloody Gore full-length and once again features cover art by the legendary Ed Repka (DEATH, ATHEIST, MASSACRE et al). A six-song slab of grisly, bone-breaking death metal jams, Dimensions Of Horror continues the development of GRUESOME's homage to the founding fathers of the genre and proves that no matter the decade, old-school death metal is always relevant, savage, and irresistible. 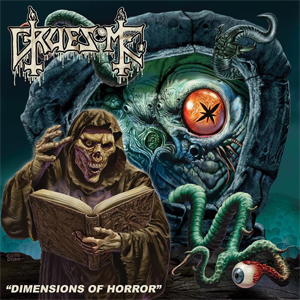 GRUESOME has unveiled a trailer of new music from Dimensions Of Horror, which can be viewed below. Dimensions Of Horror is due out May 20th, 2016 on CD/LP/CS/Digital worldwide. Physical preorders via Relapse.com can be found HERE, and digital preorders via GRUESOME's official BandCamp page HERE. Over the past year, GRUESOME has performed at numerous festivals worldwide, including Full Terror Assault Fest, Obscene Extreme America, and Netherlands Deathfest. The band has also been confirmed for Maryland Deathfest in Baltimore this coming May 26th through the 29th. Stay tuned for more festival announcements. Multi-state death metal project GRUESOME was born out of guitarist/vocalist Matt Harvey and drummer Gus Rios' mutual involvement with the DEATH TO ALL tours. Harvey served as frontman for the original mini-tour and Rios both performed Baptized In Blood and worked with DTA drummer Sean Reinert on the following US tour where EXHUMED filled in as support. After discussing and discarding the idea of putting together another incarnation of DTA to focus exclusively on DEATH's first two albums, Harvey half-jokingly suggested that the pair write their own songs in intentional homage to the band. It wasn't long before the idea gained traction, and the band soon had five tracks written. With Harvey writing in California, Rios recruited POSSESSED guitarist Daniel Gonzalez and DERKETA bassist Robin Mazen to record the material in Florida, while Harvey tracked his vocals on the West Coast. GRUESOME released a pair of single-song demos in 2014, and was subsequently signed by Relapse Records in June of that year, with a full-length release (recorded in Florida, of course) planned for early the following year. The result of those recordings would become the band's debut full-length Savage Land, a truly harrowing slab of Leprosy-styled death metal released in April 2015. It's clear from the song quality on Savage Land that GRUESOME is humbly determined to keep DEATH's classic sound alive as faithfully as possible, and the critical acclaim for the record has reflected the band's dedication. Now, GRUESOME has returned stronger than ever with their new EP Dimensions Of Horror. With an all-star lineup and unmatched songwriting skills, GRUESOME is willing and able to propel the historical sentiment and sincerity of DEATH's spirit into the present.